I watched AMW religiously in the early 90's. I believe this case would have aired in 1992 or 1993 and I was wondering if anybody can tell me if they ever caught the guy or more information on the case. This case was about two people that fell in love. They moved to Los Angeles to strike it rich in acting. He was either going to be in acting or a producer but something along the lines of acting. the male kept telling his girlfriend or wife about these huge million dollar paydays that were coming in and they were living the high life. At some point the movie thing didn't pan out and all the millions that they were anticipated never happened and he ended up murdering his wife and they broadcasted this case on America's Most Wanted. I'm sorry if I'm being vague but this was like 25 or 26 years ago when they aired this case and I'd like to find out 25 or 26 years later if there's any updates. Hello chibul, welcome to the forum! I moved your thread to the episode request or questions portion of our forum since this is where I feel its most appropriate. I'll check the capture directory but unfortunately nothing jumps out at me offhand. Hopefully one of our longtime AMW viewer members can recall the case. There was the case of Robert Michael Allen, an Fbi 10 most wanted fugitive who was swindled by a producer, and con man, after promises of producing a movie about James Dean fell through. Allen murdered the man and his son, fled with his girlfriend, killed her and buried her in the desert. After a year or two on the run, he went back to her burial site and killed himself. 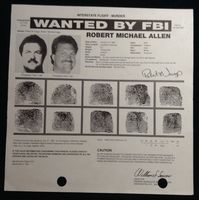 The Robert Michael Allen (aka Robert Michael Suggs) case in more detail. Allen killed his girlfriend as well as shooting and killing a con artist named Roland Jon Emr who was posing as a movie producer and Emr's son and wounding Emr's mother in a drive-by shooting in Southern California and murdering Emr's father in Arizona. Allen was a former police officer who worked as a private detective and bodyguard and had invested in Emr's film project of a James Dean biopic which turned out to be a scam.